I need a tool that will create executable files (.exe for Windows, .app for macOS, and executable file for Linux, for example: ".sh"). I want to make builds from Window for three OS. I tried JarSplice. But this tool has problems with LWJGL3. I am not working with LWJGL3, but I have gotten the following tools to work with both Windows 64-bit systems and with MacOS, for both Swing-based and OpenJDK11/OpenJFX11 projects. In both cases I use jlink to create a self-contained, customized runtime. The jlink utility places the executable in a /bin subfolder. If compiled on Windows, a .bat is built there. But I don't recommend using it. Instead, for the last stage of packaging I use Inno Setup. (I used version 5, but I think they are now at version 6). This is the same third-party software referenced by Oracle in the documentation they have for distributing Windows programs. I use it to install the program in the "Program Files" folder, and to call an executable from either the Windows Start menu or from a desktop icon. I've also used this tool successfully for file association. Also, the tool does work with 32-bit Windows, in fact that is the default. I just don't use this mode because I am jlinking. However, there are provisions for adding pre- and post-install scripts (which I haven't tried yet) and the software does appear to be being kept up to date (despite having been originally written before 2010). As I said, it works great if you are installing directly to the top Applications folder. Also kind of neat, they provide source code for the tool, if you are into tinkering. I opted to go with a simpler hack for my program. This hack is a way to create a Mac "Bundle" manually, without all the specs and Info.plist configurations. The file folder containing the program is viewed by the Mac as if it were a single .app file. Give me an hour or so, and I'll post a tutorial on this and link it here. The result can be zipped and shipped and the user can move/copy/paste it to where-ever from their /Downloads directory. For MacOS, you might consider using the tool Packages. I think I should have a computer with macOS or I should install macOS on VirtualBox but I do not want to do it because I work on laptop and I do not have so many space that masOS requires. I need analog of JarSplice that can create standalone executables from Windows for Linux and macOS. JarSplice was released in 2012. I this it is too old. I think this is reason why JarSplice creates standalone executables for Lwjgl incorrectly. Is exits so simple tool like JarSplice? Current documents on deployment that I've seen all say that you have to compile on the system that you want the program to run on. Could JarSplice running on a Windows PC really make programs that could run on a MacOS? 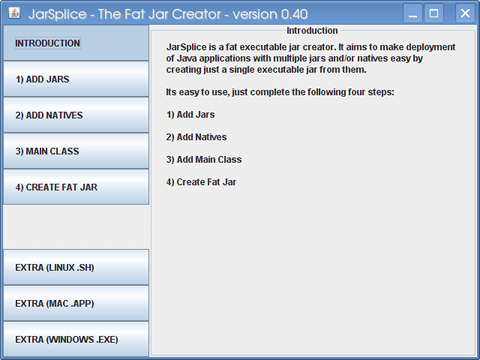 Or did the jars for the Mac version first need to be compiled on a Mac? I am using Oracle's VM on a laptop. I didn't think this laptop would support it, but it does! Maybe your laptop has similar specs and could also work? Specs: Intel i3, 2.4 GHz, 8 GB RAM, 917 GB hard disk. If I recall correctly, I gave the VM 4 GB RAM and 100 GB hard disk space. 1) JavaFX is not implemented, and does not work, and there does not seem to be a move to implement it at this time. 2) I haven't attempted to get sound to work. It could be possible to get this going but IDK and don't want to invest the effort to investigate right now. In any event, I'm able to compile jlink projects on the VM for use on MacOS, though I do rely on friends for additional testing. And I was able to download and run the "Packages" software tool I linked in the earlier email. BTW, I posted the "simple MacOS hack" tutorial. Maybe some form of that idea will work for you, but it would still require getting the emulator working. Could JarSplice running on a Windows PC really make programs that could run on a MacOS? It should be but it does not work in reality. Current documents on deployment that I've seen all say that you have to compile on the system that you want the program to run on. For example, this tool, called Unity, allows to create standalone executables from Windows (and from Mac OS X) for different platforms.